Gwyn, the lead principal, has built up a wealth of knowledge and expertise over 30 years, since qualifying as a solicitor in 1986. Gaining his higher rights of audience at the Crown Court in 2000 he has gone on to conduct numerous trials in Magistrates and Crown Courts around the country up to and including successful appearances in the Court of Appeal. He has dealt with a full range of serious criminal cases including gangland murders and multi million pound drug importations together with carrying out successful Court’s Martial appearances on behalf of service personnel throughout Europe. In the past 20 years he has concentrated on his passion for defending motorists and has come to lead a specialist Road Traffic Unit, drivingoffence.com. He has developed a track record of unrivaled success, ranging from minor speeding, traffic light and mobile phone infringements to the most serious cases of drink driving and death by dangerous driving and careless driving. Countless motorists have benefited from what Chambers and Partners guide to the legal profession describe as his “resolute and resourceful” approach. Gwyn's expertise had led to him being instructed by a number of professional footballers and celebrities and resulted in vast press coverage and in him being dubbed "Merlin the Magician" for his apparent ability to make a number of cases disappear. Gwyn also regularly acts for clients in exceptional hardship application and keeping people on the road having only lost twice in the last 30 years he has a success rate of over 99%. Representing an individual who had over 30 points on his licence and saving him from being disqualified under “totting up provisions”, this being the second time within 3 years that he had gained more than 12 points. Successfully defended a number of voluntary ambulance drivers prosecuted for using blue lights when responding to local emergencies. Press report here. Representing a policeman charged with excess alcohol, three and a half times the legal limit following errors in obtaining blood samples at hospital. Found not guilty on the submission of no case to answer. Representing a student involved in a head on collision whilst over the legal limit and who was acquitted on the basis of a procedural error by the Prosecution. Representing a former RAF Pilot accused of excess alcohol who was acquitted when the blood sample was not properly dealt with. Not guilty verdict for a motorcyclist alleged to have been speeding at 63mph in a 30mph area as a result of inadequate signage being present at the scene. Avoided a custodial sentence for a client charged with dangerous driving in what the Judge described as an "appalling" piece of driving which was captured on a dashcam. press report here. Successful appearance before the Court of Appeal reducing the sentence of a driver found guilty of causing death by dangerous driving, to 18 months from three years. Successful defence of a charge of causing death by driving without due care and attention by turning right across traffic as a result of the speed of the other driver involved. Not guilty verdict for a police officer who was on duty, found to be over the legal limit but acquitted due to procedural errors. Not guilty results for many drivers where notices of intended prosecution under S172 of Road Traffic Act 1988 have not properly been served. 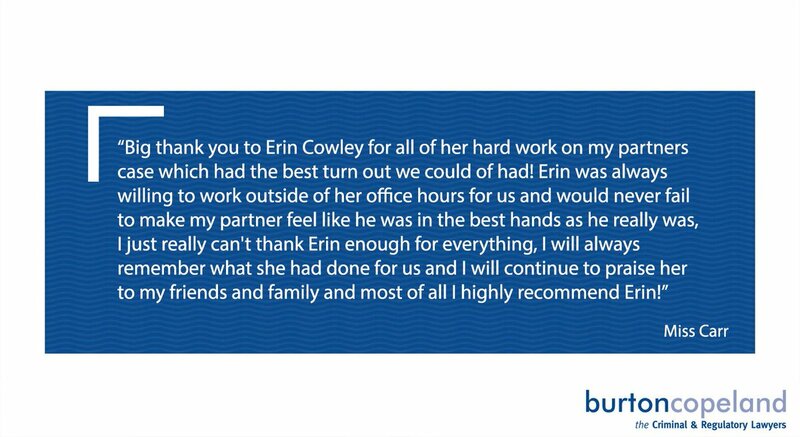 "I had need to call upon the services of Burton Copeland and in particular Gwyn Lewis. I can say that I am more than happy with the thoroughly professional way in which they brought my matters to a successful conclusion." "Burton Copeland is the first call I make if I have any motoring related questions, as they are always quick to reassure me and put me at my ease."